Located on the west shore of the mill pond at Wareham Street was once a ramshackle building known around 1900 as the “Ocean House”, possibly as a satiric barb aimed at luxury hotels which were then in vogue at the seaside. For local Middleborough children, this was their oceanside alternative. The Ocean House proved popular with neighborhood children who would dive from its open windows into the mill pond below. This activity ended, however, following the tragic 1905 death of six year old Wallace Spooner who while engaged in diving from the building struck his head upon a stone wall, fell into the river and drowned. Nothing, however, was done with the property until 1908 when the Middleborough Board of Health condemned the structure which was demolished two years later in spring of 1910. The “Ocean house,” a blot on the landscape by the river side for many years, is no more, and all the lumber has been cleaned up. The beneficial change which has resulted would well repay one a trip to the Wareham street bridge. All the old tumble-down structures are now out of the way, and the appearance in that locality is materially improved. [Middleboro Gazette, "Middleboro: Ocean House 'a blot'", May 6, 1910, page 4]. 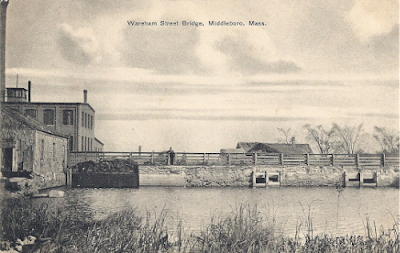 While the subject of this turn-of-the-century picture postcard was the Wareham Street dam, a portion of the so-called Ocean House may be seen at the far left. Its situation directly above the mill pond explains its attractiveness to local children who would dive into the pond below. (Behind the Ocean House may be seen the Municipal Light Plant which still stands on Wareham Street though its smokestack is long gone).